Bangalore University Exam Result 2018-19 has been released. Students can BU Result from this page. Bangalore University (BU) has released the result for UG Sem 5 & 7 Exam held in Nov-Dec 2018. Students can check the Bangalore University Result by providing the “Register Number”. The online marks statement can be checked to know the marks secured subject wise. Students are advised that the online mark statement is just for immediate information and must not be considered as the final one. The University will provide the final mark statement to the students appeared for the examination. Check the page for Bangalore University Result 2018. Latest: Bangalore University has released the provisional result for M.A. Kannada 1st and 2nd Sem Nov 2018. A student will be considered to pass the exam if he/she scores the minimum required qualifying marks. It is necessary to clear all the subject that the student had appeared for. If the student fails in any subject then he/she has to clear the subject in the next subsequent exam. All the qualifying students will be promoted to the next semester as per the university regulations. Find the links for BU Result 2018 below. Result: Click Here to check BU Result 2018. Bangalore University Revaluation Result – Click Here. Note: Other Course exam result will be declared here as per the official announcement. 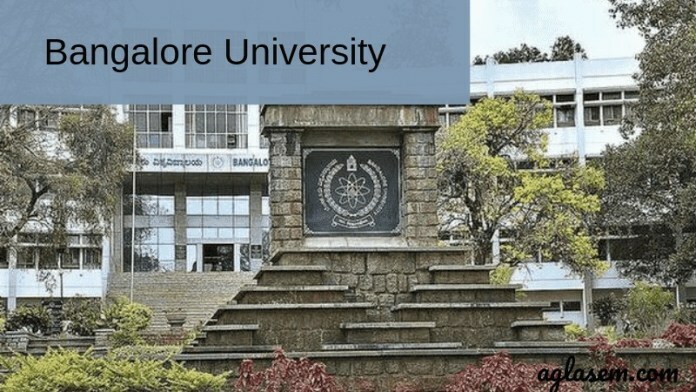 How to Check Bangalore University Exam Result 2018-2019? The students appeared for the semester examination can check the result through the link mentioned. The result can even be checked on the website of Bangalore University. Follow the steps can check the Semester results. Click on the official website of Bangalore University or click on the direct link given above. Click on “Check Result” tab. The result will be shown on your computer screen. Check the details of printed information on BU Result. Students not satisfied by the marks secured in the exam can apply for the revaluation of the answer script. To apply for revaluation of the answer script students have to fill the application form. The University will charge the students for the revaluation of the answer script. The details regarding the revaluation of the answer script can be checked on the official website or students can contact the controller of the examination for the details. The filled in application form for revaluation of answer script should be submitted within the prescribed time. No application form will be accepted after the last dated. Bangalore University conducts the examination twice in a year in semester mode ie, Even and Odd Semester. The even semester exam is held in the month of May/June and the Odd Sem in the month of Nov-Dec. The University allows the eligible students to appear for the semester exam. All the students who are eligible for appearing in the semester exam have to submit the exam application in the prescribed form along with the fees. BU issues the hall ticket to all the eligible students. BU Results are declared after the completion of the exam. Students qualifying the examinations are pormoted to the next semester.